European political integration and global socio-economic processes have created a need for new generations of researchers and policy makers who can work in different cultural settings and analyse and resolve social policy problems in a trans-national perspective. In the last decade, the European PhD in Social Representations and Communication has fostered a deeper understanding of this reality and the need for a European field of study that crosses Social Psychology and Communication Studies. The So.Re.Com. THEmatic NETwork is the logical next step as it seeks to create a "network of networks" focused on the interdisciplinary study of Social Psychology and Communication. Programme development is based on a wide scientific community needs analysis and experience acquired in over ten years of administration of the Euro PhD programme which, with its innovative training system for teaching staff and students that integrates virtual (O.D.L.) and physical mobility, encourages research in a stimulating international training environment open to multidisciplinary and multi-methodological approaches. The core of the So.Re.Com.THEmatic NETwork consists of 13 European Universities located in 8 European countries which have been successful partners in a wider Erasmus network since 1992 and since 1996 in a Socrates CDA selected by DGXXII as being among the best practices in Europe as CDAD within the IC 2000-2001. It was also selected by DG-Research as a Marie Curie Training Site Multipartner Organisation and by the French and Italian Ministries of Scientific Research and Education within the Vinci Programme. Co-ordinated by the University of Rome “La Sapienza”, site of the rapidly expanding Research Centre and Multimedia Lab of Euro PhD Centre, these programs are also sponsored by prestigious European foundations such as the Maison des Sciences de l’Homme (Paris) and are linked on regular basis with other universities, including institutions in Eastern Europe. In addition, they co-operate with other trans-disciplinary European networks that have actively participated in the Tuning Project or have specialised in O.D.L. to develop a collaborative Virtual European Virtual University. to achieve synergies with other Socrates and Minerva goals to develop e-learning for distant teaching and tutoring and to transform the current Euro PhD web site into a PORTAL. The So.Re.Com. 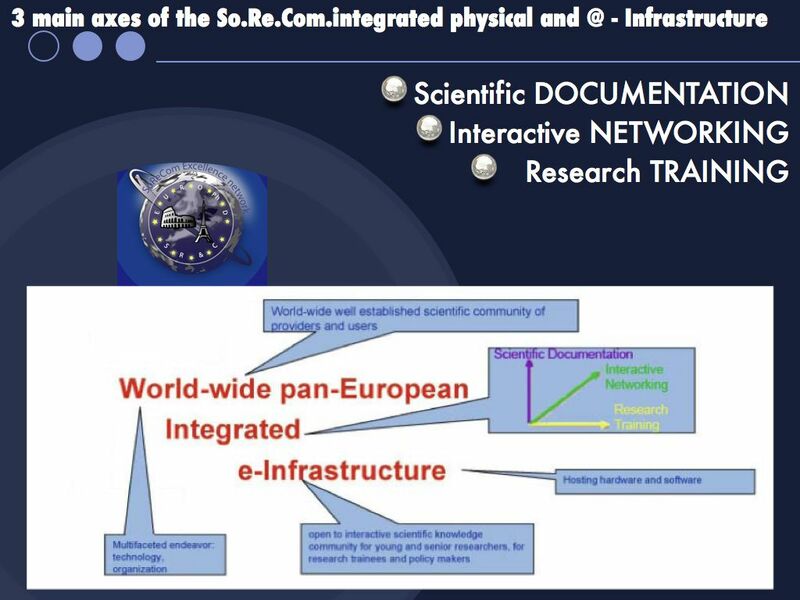 THEmatic NETwork also intends to further expand joint programmes producing multimedia research training materials and ODL tools and to disseminate “Innovative activities” begun within the Internationalisation program co-funded by the Italian Ministry of Scientific Research and the University of Rome "La Sapienza". It will also bring into being the E-Library and e-Videoconference Research Training Infrastructure on Social Sciences (E.L.VI.R.T.I.S.S. ).